8-Ball is a fairly well-rounded character. He has a good amount of Health and average Speed, but a low Initiative value. He has rather good Agility and Brawn and so is decent at both disengaging and at pinning down adjacent Aristos. Lastly he has a good Defence Ability to go with his Health, making him the second toughest character after Maximus. 8-Ball's general Switch allows him to Displace himself whenever it is activated. Displacing is the act of moving a character into an adjacent, unoccupied hex. Displacement bypasses the need for a Disengage roll and it can be used to get into Scoring Zones, adjacent to enemy characters or out of a combat that you don't want to be in! It is a good Switch to have and it can be activated fairly easily by almost any of 8-Ball's dice pools. In fact he's got a 50/50 chance of being able to activate his Displacement Switch after using either his Attack or his Action, so it should come up fairly often. Eat my Fa Jing! is a solid attack that can either be used twice or be combined with a Be water, Dude. It's damage isn't spectacular but having two chances to Displace a target a turn (and potentially damage them) can be very disruptive. The Attack's Blue dice will likely keep his Health intact even after repeated attacks. Note that an attack doesn't need to cause damage in order to be able to use the Switch and the Switch can be activated multiple times from a single dice roll! Potentially you can Displace the target twice in one attack, or even more if you can add in some (preferably Yellow) dice using Tactics cards. Be water, Dude might seem fairly situational with it's fairly short range, but it can be a good way of pulling targets out of Cover or Scoring Zones, away from a Maximus that is shielding them or out of a sticky situation that they can't Disengage from. Don't forget that Abilities can target friendly characters. It's got an ~83% chance of succeeding so is pretty reliable. If you get lucky you may be able to activate your Switch first, Displace yourself away from the target and then Place the target into an adjacent hex. This way you can theoretically drag another character up to 4 hexes in one Action. It can also be used to set up sick Gata runs! 8-Ball is a tough character with a good array of movement tricks and the potential to cause a bit of damage. He's not as controlling as Hexx3r, but actually having an Attack and strong Agility/Brawn scores lets him lock down weaker characters and allows him to retain some usefulness whilst Dazzled. Gata has the highest Initiative of any core set character and has the joint-highest Speed. She pays for this with a Health of only two however, making her rather squishy indeed. Her Defence is not as strong as her Blue+Green associates and her Brawn is poor, but she makes up for this with an excellent Agility. Gata is not one for sticking around in fights! Unlike the other characters she has two Switches. She can activate either of them at any time for the cost of two Specials. The first gives her a free Displacement and can be activated about half the time after a Misdirection attempt, just in case she wasn't manoeuvrable enough already. The second effectively acts as an extra Block and somewhat makes up for her lacklustre defence against adjacent targets, but can't be activated whilst defending at greater than range 1. It'll very occasionally be useful when stopping enemy characters from Disengaging her too. Misdirection only costs a single Energy and inflicts the Dazzled state. A Dazzled character can only use their attacks and abilities at ranges 0-1 (completely neutering those with a minimum range of 2+) and can't deal damage at a range of greater than 1 whilst defending. With an Orange and Yellow dice the chance for success is very high (~83%). Freerun is where Gata really shines. Obstacles such as the low-cover Barriers in the core game are valid targets for this Ability as are both friendly and enemy characters. She can bounce around the board with great ease, leap-frogging nearby characters and barriers to move farther than her Speed would indicate. With a bit of luck, or some Displacement-related setup, she can run between opposing Scoring Zones whilst Dazzling someone on the way! Alternatively, against a tightly packed group of characters she might well be able to Dazzle three of them in a single activation. Lastly she has a passive ability - Feline Reflexes - that significantly increases her Defence against adjacent targets by adding a Yellow dice her roll. Don't forget that a Yellow dice can roll one or even two Specials which she can use to cancel out an opponent's Success as well. This amounts to about a 50/50 chance of activating the Switch and makes her the second hardest character to hit in melee after Maximus. If she rolls two Specials but doesn't need to remove any Successes then she can just use her other Switch to Displace herself out of harm's way. Gata is a Aristo who can make the impossible happen and she's possibly my favourite character by virtue of being infuriating to play against. She shuts down ranged characters like Hexx3r, Lunah, Wild Bill and to a lesser extent 8-Ball and Parvati. Even when such characters aren't around to be harassed she can act as a fantastic scorer. There seem to be two main ways of using Gata. You can either use her aggressively, by having her go first in the Running Order and bouncing around Dazzling opposing ranged characters whilst staying away from melee fighters. Alternatively you could use her for scoring by having her screened by her teammates during the turn and then running last to get into the Scoring Zone. The latter method runs the risk of someone chewing through her paltry 2 Health before she gets to activate, but at least that way there is no risk of her being Displaced out of the Scoring Zone before the end of the Round. Hexx3r's base stats are fairly unremarkable with average Speed, Initiative and slightly sub-par Health. Her Defence is arguably the poorest of all the Aristos and her middling Agility will cause her trouble She has decent Brawn, but likely would never want to be in a position to make use of it. Hexx3r is the opposite of a frontline fighter and wants to avoid being attacked whenever possible. Her Switch, like Gata's, allows her to Displace herself, and has ~60% chance of triggering off of two Yellow dice - such as from Gotcha or her Agility - and ~69% off of three. There's also a fair possibility of getting multiple Specials off from each roll! As before, it's a pretty handy ability to have and it's likely to be used pretty often. Even on failed Disengage attempts she might be able to move away from her assailant, although she'll still lose any remaining Movement Points. Gotcha! is a neat little Action that has a fair chance of Immobilizing the target if it succeeds and potentially imposing a Speed penalty even if it doesn't. If you are lucky then you may even get both! The -2 Speed State is crippling for slower characters such as Maximus and Immobilization is a death knell for Gata. Vade Retro is what we are all really here for though. For 1 Action Point you have somewhere around a 70% chance of Displacing your target. This can easily get characters in or out of Scoring Zones, can put your melee characters into killing range or can extract engaged allies. Each Yellow dice also has a one third chance of activating Hexx3r's Switch allowing her to Displace herself too, so she ends up being pretty nimble despite her middling Agility and Speed. Hexx3r is like a hyper-focused version of 8-Ball. Whilst she doesn't have any attacks at all, the abilities she does have will give her team almost complete positioning control. In a game that is fundamentally all about movement and positioning, Hexx3r is the undisputed queen. She's also probably the character that can have the greatest impact on the game when coming back from the Infirmary in the -2 Energy State as she can Move and then Vade Retro an opponent out of the Scoring Zone. Lunah has middling Health, Initiative and Speed - just like Hexx3r - and so is clearly not a front-line fighter. Her Defence is good, especially as she'll often be acting from behind partial cover, but her Brawn and Agility both leave a lot to be desired so all the more reason not to get up close with her. Lunah starts as she means to continue with her Switch which allows her to Nullify a Block from her opponent's roll. Whilst this will very occasionally come up when she's defending, this is clearly a method to boost her attacks. Consider this a portent of things to come. Called Shot is a highly damaging attack that scores almost three successes on average! Beware the fact that it has a significant minimum range though. Suppressive Fire is a good way of pinning down an opponent. It has about a 75% chance of imposing the -2 Speed State, which is always unpleasant, and a ~45% chance of dealing a point of Damage too. It's worth noting that this is the only current way of dealing Damage using a simple roll. It has a slim (~5%) chance of dealing two points of Damage instead. Both of Lunah's Passive Skills revolve around ways for her to deal yet more Damage. Marksmanship works as in Infinity by denying partial cover (a bonus Black dice) from her opponents and notably it also works when Lunah is defending. Veteran Sniper allows her to exchange one or more Black dice for Orange ones. Typically this would be used as a way to bump up her Called Shot whilst she is in cover, boosting her up to an average of ~3.7 Successes. 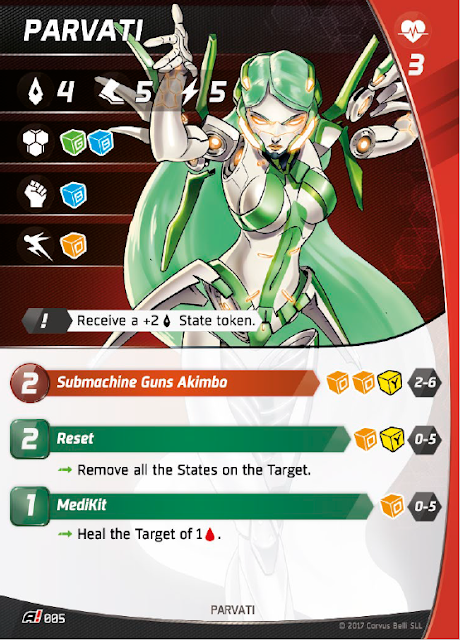 Combined with her Switch and ability to deny cover bonuses and she can reliably knock out Gata and has a decent shot at any 3 Health characters, especially if she can follow up with a Suppressive Fire. Lunah's only job is popping heads and she's pretty darn good at it. If you can feed her a couple of tactics cards for bonus dice then she can one-shot anyone short of maximus or maybe 8-Ball. 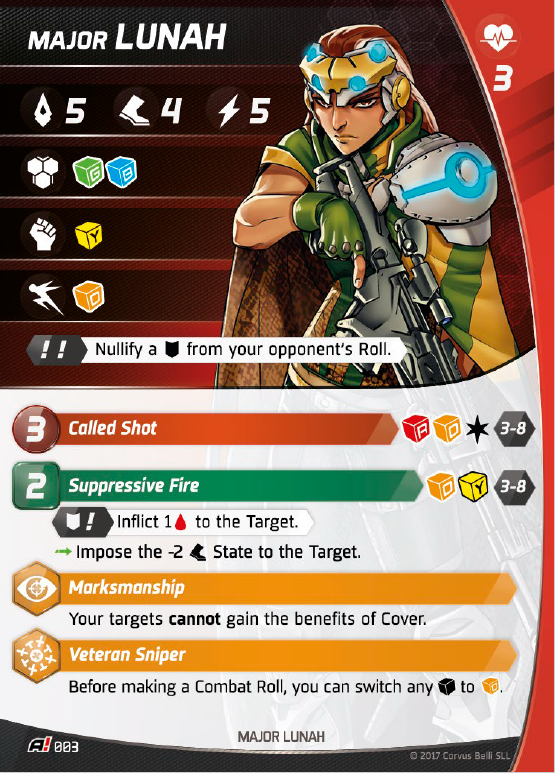 Ideally you want to be in a position where you can use Called Shot and Suppressive Fire every turn, but often that's a tall order. 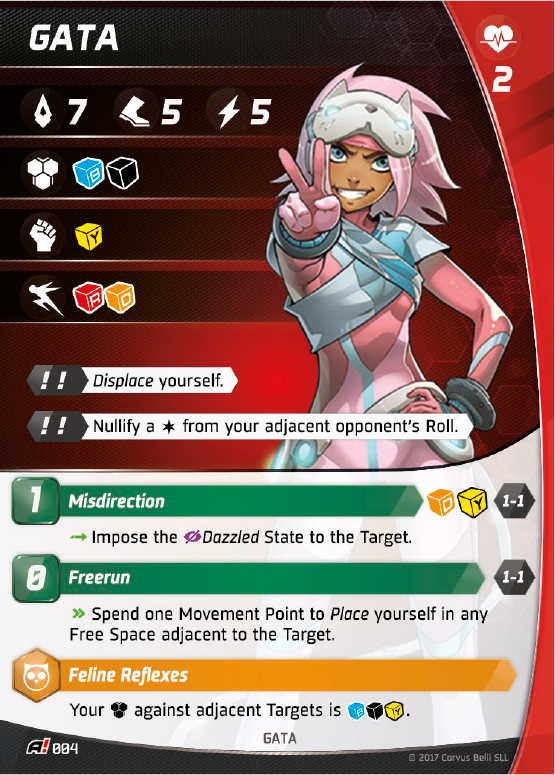 Her downside is that you really need to think one turn ahead with her placement and in some cases she can end up very out of position or isolated depending on where the Scoring Zones end up. Maximus is a tank whose job it is to protect his allies. He's got a whopping 7 health, excellent Brawn and has an automatic block result added to his Defence rolls. His weaknesses are his low Initiative value and his slow Speed of only three. To make up for his slowness he has a Critical Success for his Agility, meaning that the only way of stopping him from disengaging is by scoring a Critical Block which currently no character other than Maximus can do! He has an always available switch which can impose the Taunted state. A character which is Taunted can only choose the opponent that put them in that state as a target. It doesn't impact their ability to target other characters using non-attack abilities however. 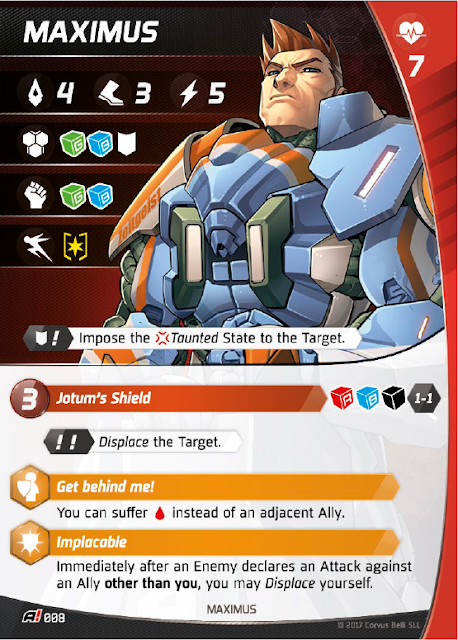 It triggers about half the time off of Jotum's Shield, ~61% of the time off his Brawn and ~77% of the time off his Defence, assuming you don't need the Blocks for actually nullifying Successes. Keep in mind that Taunting someone using your Brawn or Defence typically isn't that useful because it will wear off at the end of that character's Activation anyway. Jotum's Shield is a fairly defensive attack that will occasionally push through a point of damage (probably off of a Critical Success). It's main purpose is to apply the Taunted state and to occasionally displace the target, potentially freeing up allies from needing to disengage. Honestly, you are probably going to be spending many of your activations using Move twice! Get Behind Me! allows Maximus to absorb damage from his weaker allies using his massive health pool. A common tactic is to leave allies on one health before putting damage onto Maximus, leaving everyone damaged but alive. Be aware that he may end up soaking more Damage than he would usually due to the fact that he isn't making use of his exceptional Defence whilst doing this. 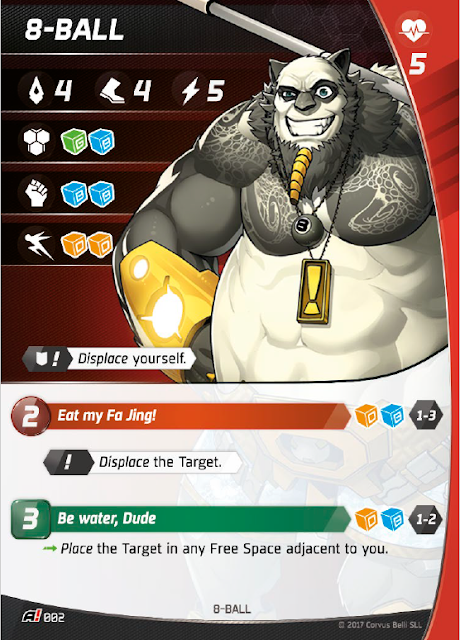 Implacable greatly makes up for Maximus's slow movement value and encourages him to act later in the round so that he can be displaced far enough to both move and attack on his own turn. As the Displacement takes place before the Attack itself you can sometimes use this in order to bounce between multiple nearby allies, shielding them in turn with Get Behind Me! Maximus is great against a team that has a lot of attacking characters and he has multiple ways of shutting down or punishing characters who want to be aggressive. The downside is that he is quite weak against teams that aim to be more controlling and are more Action based. He might well flourish in a team with Lunah and Hexx3r, both of whom will be happy to have a meatshield guarding them and the latter can move Maximus into position as needed. Miyamoto has excellent Initiative, good health Health and a maxed out Speed value, making him arguably the best character in terms of raw Attributes. His Switch is simple and obvious. Convert any excess Blocks into Successes and keep dealing damage, possibly at the expense of his own Health! Be careful that you don't overuse this ability at Miyamoto's expense as he's liable to end up in a Wounded state from all the defender's successes coming back at him. This Switch can also be used when Mushashi is trying to Disengage and so turns his already ample Agility into a near certainty. Ken No Sen is a highly damaging ability and if you manage to pull off the Switch then Miyamoto can comfortably one-shot almost every other Aristo in the game. My back-of-a-napkin calculations say that he has about a one third chance of activating the Switch each attack, but this drastically goes up if you can use some Tactics to roll more dice. 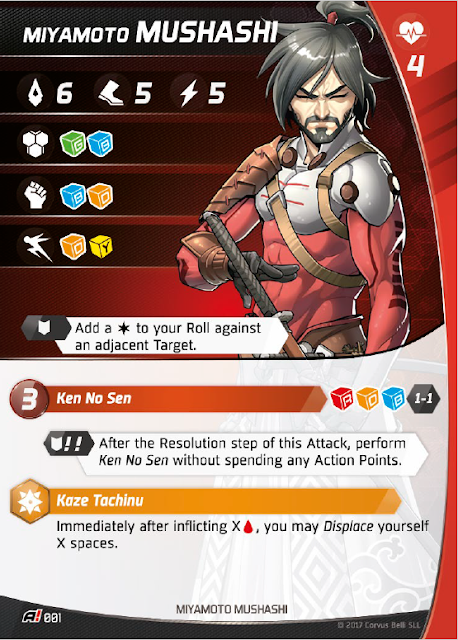 Kaze Tachinu is a fantastic passive ability, keeping in mind that it works at all times in the game and not just in Miyamoto's activation. Importantly, it can be combined with the switch on Ken No Sen to attack one character then displace away and attack another! With a lucky string of rolls it's possible to cut up several weaker or wounded characters in a single turn! Miyamoto is probably the most straight forward character, maybe even more-so than Lunah, and his sole purpose is getting up close and putting other Aristos into the infirmary. In many ways I prefer him to Lunah as he isn't inhibited by the Dazzled condition and is generally more self-sufficient. He can also launch a nasty surprise when coming out of the Infirmary by respawning next to an enemy character, probably whomever scored last round, and chopping them in half immediately before Displacing away. He would often benefit from being teamed up with Parvati who can patch up any injuries sustained whilst he aggressively uses his Switch. Parvati has excellent Speed, but below average Heath and Initiative. Her Defence is good but she lacks any real ability to Disengage from adjacent enemies or to stop them Disengaging from her. From this we can tell that she's clearly not meant to be a front line fighter but is more likely to want to skirt around the outside of any brawl, relying on her Defence to keep her safe from opportunistic attacks. Her Switch makes up for her low base Initiative quite nicely. It's easy to trigger off both her Attack and one of her Actions so she should be making use of it pretty much every single turn. Don't forget that it doesn't stack with itself though. Submachine Guns Akimbo is a powerful Attack that can be used twice in a single Activation and can often pick off lower health enemies in a couple of bursts of gunfire. Whilst it isn't as powerful as the attacks from Wild Bill, Mushashi or Lunah the fact that it only costs 2 Action Points is very significant. 8-Ball is the only other character to be able to naturally attack twice in a round, but he doesn't do much damage. Reset is a straightforward Action with somewhere around a 75% chance of success. It removes all States - Dazzled, Immobilized, Poisoned and Taunted, along with all stats buffs and penalties - from a single Target, including opposing characters if needed. Currently this is the only way to remove States so is an invaluable tool and will only be more so as future expansions come out. MediKit is a handy thing to have as it has a 66% chance of removing a single point of Damage from a character. The fact that it is only a single Action Point means that you can easily slot it in whilst also performing combinations of Move, your Attack and Reset. Both MediKit and Reset can also be used on Parvati. Parvati is the closest we have to a dedicated healer for now, but is no slouch in combat either. The long range on both her Actions and Attacks means that she doesn't need to move around too much, but can do so quickly if she finds that she has to. Overall her most useful trait is her ability to remove States, but don't discount her capability for dealing damage too. In terms of weaknesses, she becomes near helpless when stuck to an adjacent enemy. Her Agility isn't great and her Attack doesn't work at range 1 so make sure to have someone on the team who can extract her from sticky situations. Lastly we come to the cowboy, Wild Bill. With good Initiative, and fair Speed and Health he's a pretty good all-rounder. He's got good Defence but like Lunah he struggles with low Agility and Brawn and so doesn't want to get into melee. His Switch is pretty unusual. For the 'low' cost of two Blocks you can draw an extra Tactics card, but opportunities to use this are likely to be few and far between as you'll be spending most of time rolling Orange and Red dice. Still, it's an intriguing option. As Twin Pistols is the only thing to spend Action Points on, other than moving, you'll be using it a lot. 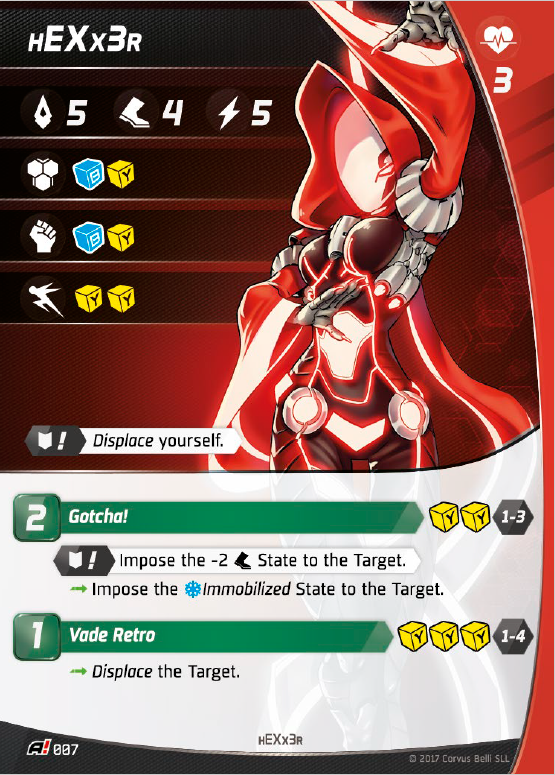 It's straight up the most powerful Attack in the game - tied with Lunah when she chooses to sacrifice her cover bonus - and has good range, so you should be happy to do so! It also has a pretty exciting Switch. If you can score three Specials then you can make another attack with Twin Pistols against another valid target without spending Action Points! In theory if you then score another three Specials then you can keep going back and forth between characters indefinitely. Unfortunately your odds of pulling this off are fairly low unless you can find ways to add dice to your roll using Tactics - preferably Yellow. Gunslinger is a fun little Passive Skill that lets you swap your dice when defending from safe Green+Blue to a very aggressive Red+Orange. Low Health characters may end up being too scared to attack you, but be aware that it is still only usable at ranges 2-6. 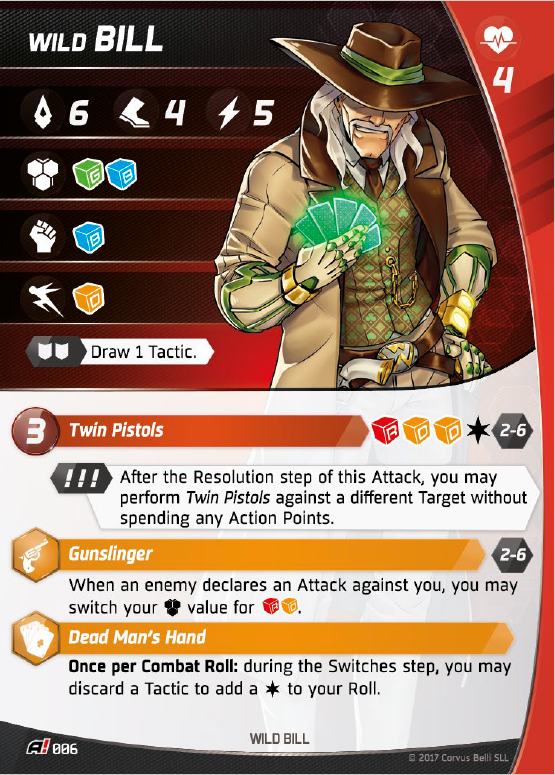 Dead Man's Hand let's you convert Tactics cards for an additional Success (effectively a point of Damage) once per roll which can often be enough to push through lethal damage on an one of your attacks. 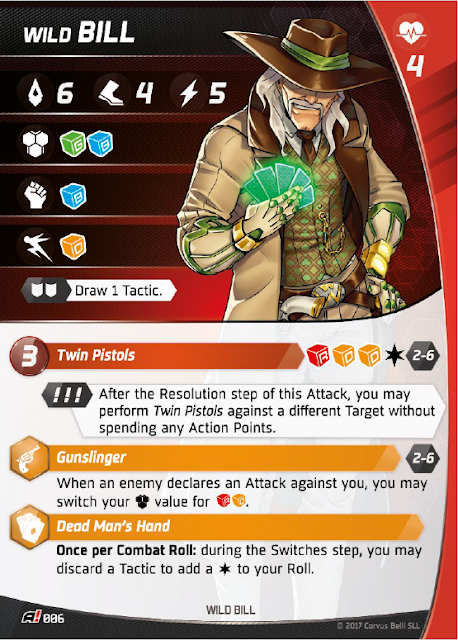 Unfortunately that means that Wild Bill is incredibly hungry for Tactics cards as he also pretty much needs them to activate his Twin Pistols Switch, so he's probably best paired up with characters that won't need them as much. Basically Wild Bill will do a ton of damage if he's well supported and not overly disrupted, but an opponent that puts their mind to it can find plenty of ways to shut him down. Very well I am getting more and more interested! You're welcome, it's shaping up to be a sweet game!